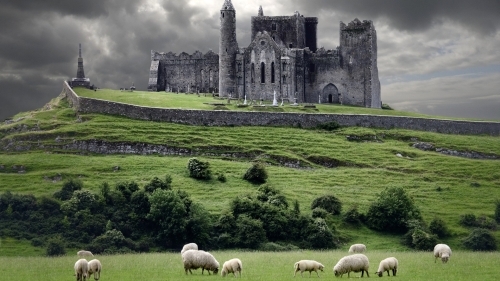 There is a flight from Vancouver to Dublin, Ireland for $552 CAD roundtrip including taxes departing in late September on WestJet. The available dates are extremely limited, so I'm not sending this one out as an e-mail alert. It would be gone within minutes, leaving most confused. 1. Use one of the following Kayak links..
2. Make the booking through Kayak. Note, the booking is actually being processed by Airfare.com (Kayak uses Airfare.com to process their internal bookings). The price will show up as $451 USD on Kayak, and then converted to $CAD on the booking page. BTW, the results may only show $769 USD Aer Lingus flights when trying the exact same link on a mobile device. It seems that Kayak redirects mobile users to slightly different results. On a standard desktop computer, the $470 USD results appear. The name of the major airline is 'hidden' - but it is undoubtedly WestJet, based on the departure and arrival times, and the number of stops. vancouver, yvr, flight deals, westjet, europe, northern europe, western europe, dublin, ireland and dub. 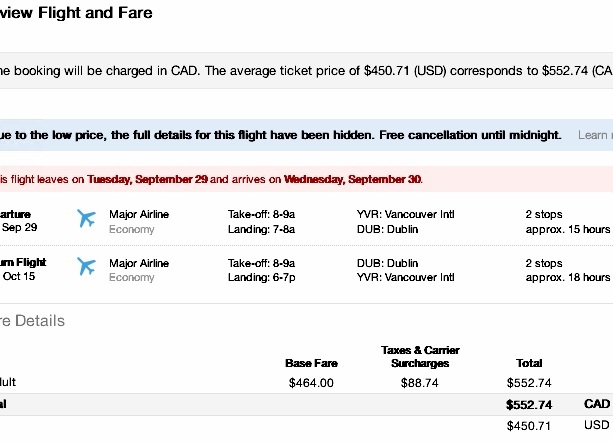 One Response to "Vancouver to Dublin, Ireland - $552 CAD roundtrip including taxes"
Any specials for Paris that you have seen lately?